The UK isn’t the sunniest place on earth… Far from it! But that small little fact doesn’t mean that European cities aren’t able to make use of the incredible energy of the sun. Urban authorities are increasingly tapping into the vast, yet underutilised energy resource from above to power their public utilities. There are three processes occurring simultaneously that are allowing this shift to occur. Firstly, urban energy-use is increasing, but so is the pressure to wean cities off ghastly fossil fuels. Whether its pressure from ‘the powers above’, the idea that residents ‘vote with their feet’ or the increasing costs of energy usage (…or perhaps even simply good environmental ethics! ), local authorities are attempting to lead by example by switching to renewable sources when possible. Secondly, as populations grow, so does the vulnerability of already fragile urban energy grid networks. To minimise the risk of public utilities coming to a complete crash in the event of a crisis, governments know just how important to move towards small-scale, localised energy generation. Last but not least, renewable technologies are very quickly improving to become very competitive with other energy sources. Whether technological improvement, or demand, is the chicken or the egg, I’m not sure… But for one reason or another, PVs, sun-tracking systems, energy storage and transmission systems are making leaps and bounds in efficiency. So, even on a typical (sorry to say it - but miserable) British day, solar energy systems are able to capture the sun’s energy and turn it into something useful for us little ants down here on planet earth. Amazing stuff, isn’t it? On top of all of this, devices themselves are also becoming more efficient. LED street lights for example, are quickly replacing the old run-of-the-mill HPS lamps, cutting public lighting energy demand by up to 80%. This all means that some pretty cool changes are happening in the public realm. 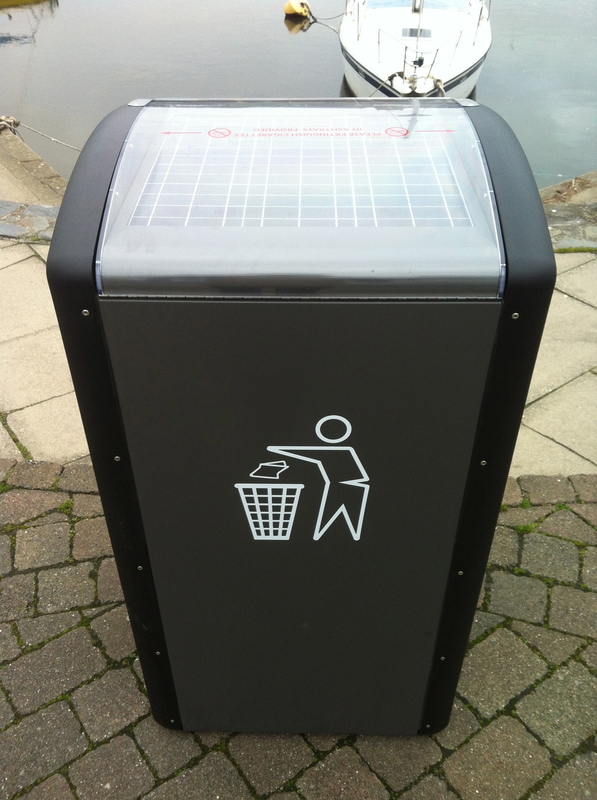 For example, I was impressed by this (right) pretty standard-looking bin in Wales recently - which turned out to be not-so-standard after all! Using solar energy to compact the garbage inside, the need for garbage collection is dramatically reduced. This saves the authorities money and cuts CO2 emissions. Nifty little technological advancements like these are helping to create an energy efficient urban future.